I’m still plugging away on the edits for Sanguine. Less than 70 pages to go but I’m into the stuff that’s harder to fix now and I am currently hating this whole section. At the moment I’m trying to find a balance between emotion and melodrama — and between background info and info-dump — all in the same scene. Um, no. I’m working against that. I lost a fair amount of time on Thursday doing the Thursday Thread challenge. Writing a short story using the prompt isn’t the problem – getting it down to 250 words is. I had over 500 words when I finished and had to cut over half of them. I liked the story though, so I might put the words back and polish it up to put on Watt Pad or something. On a brighter note, Word now recognizes Kaen’s and Gregor’s names again. I have no idea why it refused to acknowledge them before (just in one paragraph) but I’m blaming retrograde Mercury. Actually, I’m blaming retrograde Mercury for everything. I’m actually quite pleased with the weekend’s progress, all things considered. I’m going through a phase where I wake up every couple hours all night long, so between that and my job (I’m in the middle of six in a row) I’ve been feeling pretty tired and dragged out. I have managed to fix a few things at the beginning of the book that one beta reader said were problematic. For instance, I slipped in some more background information for character development for those who aren’t good at reading between the lines. There are a few more scenes to fix later in the book, things that are bothering me but that the beta readers never got to. One is strictly character related. Mirela needs more fire. Currently she’s a weak, weepy mess, and not the strong, fun-loving, adventurous woman that I had envisioned her to be. And while I’m adjusting secondary characters, Gavril needs a darker tone. And then there are a few shaky leaps of logic that need to be shored up. Actually, Gavril and the logic flaws will be the most time-consuming to fix. They are related, the result of a late-appearing plot bunny masquerading as a flash of inspiration, and are going to take some sorting out and rethinking. (Inspiration for what, I’m not certain. And there is still a chance that I might change that part. We’ll see how the next (hopefully final!) round of edits goes. Kaen and Gregor have finished their shower and Kaen is making Gregor drink another glass of a health drink. Gregor took a sip, then drank more deeply as his body accepted it and hungered for it almost the way it hungered for his Master. “You know what I mean.” Gregor looked away. Had he misread everything about Kaen? There was something lost and pleading in his tone and Gregor turned to look at him, then gently reached up and touched his face, remembering that Kaen had been alone for a very long time, lost and wandering for centuries that had turned into millennia. My weekend project will be to get Sanguine fixed up so I can get it printed for what I hope will be the final edit. Anyhow, Sanguine is going to be my project through the weekend. I doubt that I’ll get it printed before Wednesday, though, which means I’m most likely not going to make my goal of having it come out this month, as it will have to be edited, corrected, and formatted. Oh, and I need to make a cover for it. And write a blurb. I hate writing blurbs. And all of the front stuff: copyright, acknowledgements, disclaimer, etc. Not hard, just annoying. *sigh* This is the first time that making a list of stuff I need to do is making it seem worse than it actually is. It should go a little more smoothly than my formatting for Song and Sword, though. I hope. Once Sanguine is published, and Song and Sword is fixed, I can focus on The Other Mages trilogy. I still have a goal of getting it finished and released this year, although I think that the Academy of the Accord series is going to get pushed back. Again. For The Other Mages I’m thinking of flying solo — no beta readers. But we’ll see. I’ll probably have a crisis of confidence before it gets finished and published and will be looking for a second opinion again. Which I probably won’t get and I’ll swear off beta readers again. How is this going to affect my writing time? In a perfect example of the perverse logic that is my life, working will actually make me more productive as far as writing goes. If the last nearly 6 months has been any indication, the more time I have to write, the less writing I actually do. I’m not good at self-imposed deadlines either, which is why NaNoWriMo is so great for productivity. Oh, sure, nothing bad will happen if I don’t win, but since I haven’t lost yet it’s a matter of pride now. I am good at finding time and making time. And if I have to find it or make it I use it. But when I have huge blocks of time I find that I’m not good at using it. I don’t have as much time to think about storylines at this job, or as much (any!) downtime to scribble a few lines of story, but I also have a ten minute round trip commute vs. two hour round trip commute. I need routine, and I’m not good at creating one and making myself stick to it. But now that I have an outside schedule to stick to I can write around it. As soon as my body stops screaming. Continuing from last week. Kaen is helping Gregor into the shower. Gregor choked back a giggle and let Kaen help him out of his clothes and into the shower. Kaen’s clothes joined Gregor’s on the floor and he surrendered to Kaen’s hands as they washed him, leaning back against his Master’s broad chest, his eyes closing as Kaen’s hands roamed his body. Abruptly Kaen turned off the water and wrapped Gregor in a towel, then lifted him easily and carried him out to the bed. Since it’s Valentine’s Day I thought I’d write about romance. There’s just one problem: I’m not a romance writer. Oh, sure, there is the M/M relationship in Sanguine. And while the relationship is essential to the characters (and thus to the plot) I can’t really classify it as a romance novel. And in the novel without a real name yet that I took an excerpt from for Love Spanks there is a relationship between two female characters, but, again, it is not really the crux of the plot. 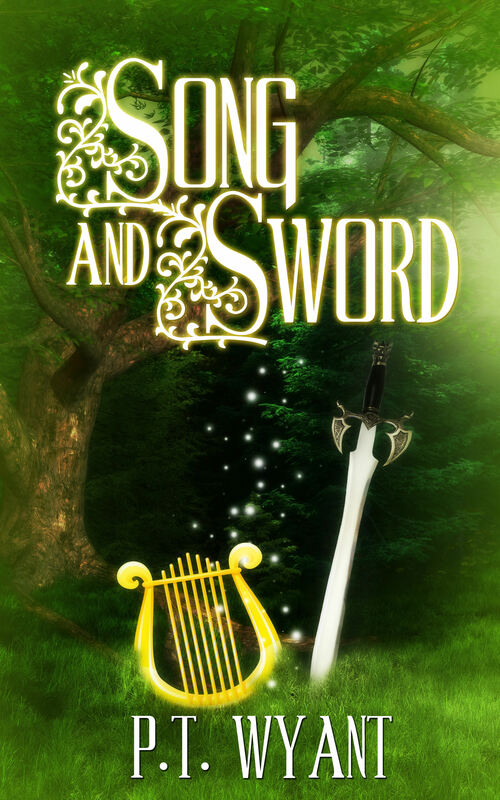 There is romance (for lack of a better word) in Song and Sword, but, once again, it’s not the focus of the novel. The Other Mages trilogy is (so far!) romance free, depending on how Book Three works out in the rewrite. The Academy of the Accord is… Well… I’m not sure I would call the relationships in any of the books “romantic.” Sensual and sexual and loving, but they don’t really fit into the “romance” category… there is no wooing or dating or anything like that. Wait a minute. I said I didn’t write romance. What’s up with all of these relationships? I don’t write romance, but I do write relationships. My writing tends to be very character driven. I may (sometimes) start with a basic idea for a world or setting or story, but almost everything grows up around the characters. And characters don’t exist in a vacuum. So, characters who don’t exist in a vacuum have relationships with other characters. Sometimes friendships, sometimes something more than friendships. And sometimes – oftentimes – relationships between the characters are not planned in advance. For instance, in what is now Book 5 of The Academy of the Accord series, I had no idea that two of my male warriors were lovers until one of them joined the other in bed. That worked out really well, though, and I went back and worked it into earlier scenes in that book and developed it through preceding books. Love Spanks weekend is officially over. It was fun and slightly insane and highly educational. Among other things, I have learned that I am a control freak. I probably already knew that, but it really hit home to me over this past weekend. And that’s why, if anything I write ever becomes a movie, I want to write the screenplay and have final say in everything. It’s my vision. That is also why I’ve been leery of having guest posts on my blog: I want to be in control of the content. Yep. I’m a control freak. This whole Love Spanks weekend brought it fully into focus, though. I discovered that I am even more possessive of my blog than I had first thought. And then came a template for the event. Four hundred fifty words that aren’t mine and that don’t relate at all to what I write. Four hundred fifty words that belong to someone else before you even get to mine. I wanted to blow something up. I wanted to flip tables and rage quit. I put them there and I hated myself for doing it. At the time, I felt like I was selling out, although now that I’ve had more time to think it through I realized that I wasn’t – what I was doing was following through on a commitment of sorts. So, yeah, I’m a possessive, territorial control freak. Am I the only one who feels like this or do others struggle with the same issues? If you do, how do you deal with them? And if I am the only one, why doesn’t it bother anyone else? This is my regular Sunday Snippet post, an excerpt from Sanguine, a science fiction novel (still in progress) with elements of semi-paranormal M/M romance. If you’re looking for the “Love Spanks” entry, click here or on the logo at the bottom. Continuing from last week – Kaen has fed from Gregor too soon, and is trying to get him to stay in bed while he deals with people coming to the ship to discuss interior design. “I thought you admired that about me,” Gregor muttered, struggling to his feet. Kel is a Sword Dancer, which is an outlawed form of swordsmanship. That’s the second strike against her: the first is that she is female, and women are not permitted to take up the sword or train as warriors. She has spent most of her life masquerading as a male. Tirza is a wannabe wizard. However, she comes from a race where magic is frowned upon and not accepted, even though the ability runs strongly in her family. (A spell, attempted without proper training, backfired on her mother and Tirza was born during her death throes.) Tirza has left her homeland in search of her father, a man she has never met. Kel rescued Tirza from some less than honorable men and somehow found herself agreeing to guide her through the Easthalt Marshes to the Eastonesse Barrens, where her father is reported to live. Along the way, Kel began to have feelings for Tirza – who thinks that Kel is male. They found his home, and Tirza went to speak to him alone, leaving Kel in the nearby village, promising to return long before dark. As the afternoon wore on, Kel felt sure that things had gone well for Tirza, and was both glad for her and sorry for herself: it would be hard to leave her. But as the sky began to darken, Kel grew concerned, and started along the road to meet her. The Barrens were not a place for the unarmed and unprepared once darkness fell. She reached the path that the tavern keeper had told them about with no sign of Tirza, so she turned and entered the yard, listening. Children’s voices rang through the early evening as they were being herded to bed, and she smiled as she knocked on the door, expecting to find Tirza, caught up in meeting her new family. Kel’s eyes hardened and she turned on her heel and left, feeling fear rising in her throat. Tirza was out here alone somewhere, no doubt hurting and scared and lost and darkness was rapidly falling. She followed the path back to the road, trying to read the tracks in it, but her own boots had blurred any sign of Tirza’s passing. “Tirza!” she called, even though she knew it was hopeless. Silence and the call of an early-rising night bird was all that came back to her. “Tirza, where are you?” she pleaded silently, trying to calm her mind to listen for an answer. The Bond Blade at her hip seemed to send a sense of warmth through her and she took a deep breath and started walking, alert for any sign of Tirza or signal from her sword. Impulsively, she drew the blade and let it guide her – it seemed to turn in her hand and she turned with it and could see the broken branches where something – or someone – had pushed through the scrub at the edge of the woods. “Tirza,” she whispered, and started into the forest after her. Her heart rose into her throat when she heard the river and she sheathed her blade, breaking into a run, terrified of finding… nothing. Tirza had lain on the river bank until she had sobbed herself out, then slowly came back to herself and began trying to work out what to do next. She could go back to the village, find Kel, tell the warrior that all had gone well, send him on his way to wherever he wanted to go – and then what? She looked at the river and nodded. Once Kel was free of her, she would give herself to the river. Unbidden, the vampire’s image appeared in her mind. Or to Gansek. Her breath caught in her throat at the thought, both terrified and entranced by the idea. Gansek wanted her, and death from his fangs would not be unpleasant. She heard someone coming and scrambled to her feet, her heart in her throat. If it was Gansek, would he let her bargain for time, time to get Kel safely away? Panic subsided as Kel saw a form crumpled next to the river, and when Tirza rose to meet her she almost cried with relief. Tirza nodded and let Kel lead her back to the road. “That is not true, my lady,” Kel said, stopping and turning her to face her. She tilted Tirza’s chin up and looked down, losing herself in the depths of her brown eyes. Tirza closed her eyes, unable to face Kel. She felt one of Kel’s arms encircle her waist, and her eyes flew open when she felt Kel’s lips on her own. With a soft sob she yielded to the kiss, her arms encircling the warrior, her hands resting on his shoulder blades. Kel nodded. “Your father was not exactly shy about expressing his opinions.” She pulled Tirza back to her and kissed her again, her lips hungry and passionate. Tirza looked at the warrior, confused. Kel had cared for her – cared about her – before this? And still did? Even knowing? “Kel…” She wrapped her arms around the warrior and leaned against him for a moment, her face against the leather of his tabard, relaxing as the warrior’s hands rubbed her back, soothing her. Tirza smiled and rested her hand on the warrior’s arm, desperately needing to feel him. He wanted her. Before what her father had said and despite what her father had said, Kel wanted her. And not just for pleasure. Tirza’s eyes filled with tears – the first tears of happiness she had ever known. Tirza shook her head. “I — I have just never felt this… this happy and… and wanted… and…” She stopped, not wanting to say it. Kel stopped and turned Tirza to face her, smiling down at her for a moment before pulling her against her, holding her tightly. She knew she shouldn’t. She knew she should stop now before it was too late. And she knew it was already too late — it had become too late when she had kissed Tirza in the forest, when she had yielded to feelings and passions that she had never known existed. Something in the warrior’s words sent a chill of fear down her spine. “Kel?” She pulled back to look up at him, but the warrior shook his head. “It’s all right, my lady.” Kel cupped her cheek with one hand, then turned and continued toward the village. The question: What do you think is going to happen when Tirza learns that Kel is a woman? Now, go forth and visit the other blogs and spread the love!